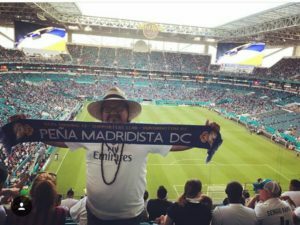 Your DC Peña traveled to Miami to cheer our Real Madrid! Here’s a summary of events from two of our Peña Members, Miguel and Louí. The uniqueness of it all was palpable. 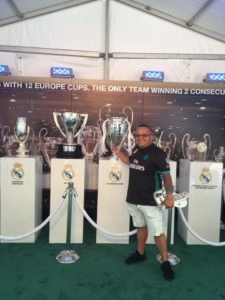 The seeds of soccer fascination had been sown wide in Miami for the past few weeks prior to the game as everyone, it seems, artists, reporters and marketers, small shops and big brands, tried to attach themselves to Saturday night’s big show. Yes, tickets were expensive and El Clásico in Miami was a major soccer business venture, but the fans didn’t care. We’re talking about the biggest rivalry in the world of sports. The city of Miami was a perfect place to host the match. The whole city was boiling with expectation and events regarding the Clásico. Real Madrid and Barcelona faced off in the scorching Miami heat as the teams met for the first time on American soil. It was just the second time in history the rivals played each other away from Spanish soil. 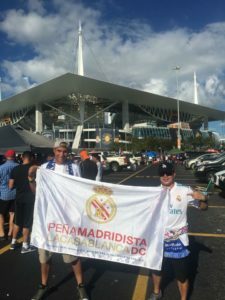 For the ticketless events like the Casa Clásico in Bayfront Park in downtown Miami offered a chance to sample the atmosphere of a rivalry that dates to 1902. 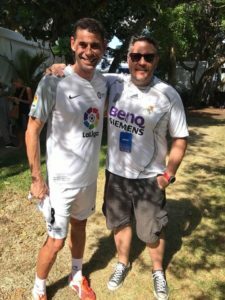 On Friday, live music filled the air while La Liga legends like Patrick Kluivert, Fernando Hierro, Morientes and Carles Puyol competed in a small exhibition game along stars like Paolo Maldini, Lil Wayne and Drake. Although it was officially an exhibition game, the intensity on the field, and in the stands, proved that there is nothing friendly when these two teams get together. Both teams payed with intensity and gave the fans an unforgettable experience. The game served as a barometer for soccer in the US. The US is now a more important market for European soccer than Asia. Real Madrid has been doing their pre season training in the US for some years now. And this is great for us, the fans, we get to see our team train an play without having to take a flight to Europe. The gathering of the Peñas was an unforgettable experience. I used to be part of an important Peña in Spain, and we might be fewer numbers in the States, but we are more passionate and better organized that our Spanish counterparts. 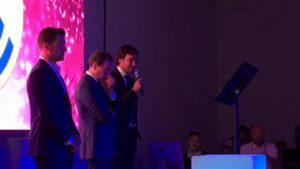 And the Noche de Campeones at La Scala Miami is proof that the Madridismo sentiment is huge in this country, that the club acknowledges and cares about our support. As mighty Butragueño said that night “The passion for soccer in this country is palpable, and it shows that El Clásico is a game that transcends borders”. El Clásico Miami. The title itself, sets high expectations: El Clásico, South Beach, and the possibility of making bad decisions. 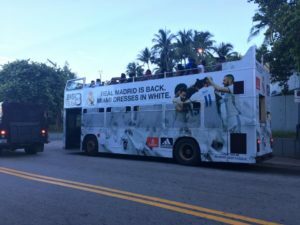 Downtown Miami was all-in with advertisements on every bus and billboard. The crests of Real Madrid and FC Barcelona were paraded on every street. It was like a Clásico was meant to be played there one day. 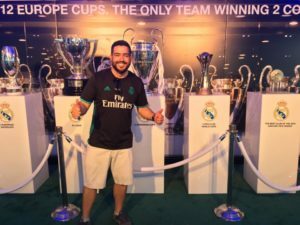 From the moment I came into town and put on a Real [Madrid] shirt, I was greeted by perfect strangers in passing with the most affectionate phrase…” Hala Madrid!” For a life-long Real Madrid fan, I was living the dream. 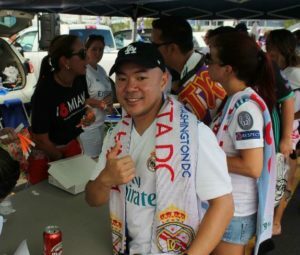 The Casa Clásico event at Bayfront had fans of Real Madrid, Barcelona, and neutrals co-mingled together with opportunities to purchase overpriced food and beer. The smart move was to eat prior to entry and walk in for the rare opportunity to pose with our trophies without having to fly to Spain. I took the opportunity to stay at the YVE hotel at a group rate thanks to Peña Atlanta. The downtown location was across the street from Casa Clásico. Hanging out with Atlanta at the downstairs bar was like a regular watch party. We sang songs that got the attention of the entire hotel. 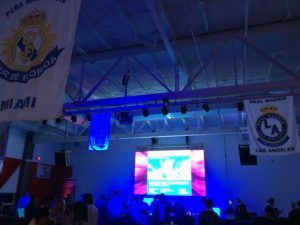 The Night of Champions party; what can I say? 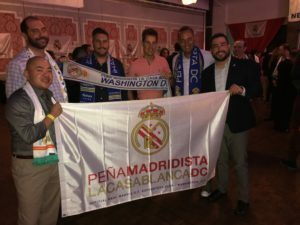 All of the US Peñas in one place with representatives from Real Madrid. I reunited with old friends from Los Angeles and made new friends from everywhere else. This made the pre-game tailgate a continuation of the night before. 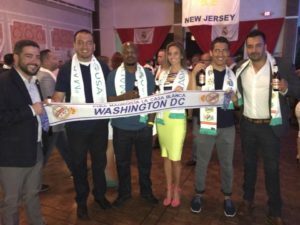 It was an honor to represent the D.C. Peña. Our network is amazing! The game was exciting, but in the big picture, did not matter. The Peñas were the most important part of the Clásico. I will strive to bring that same passion back to D.C. 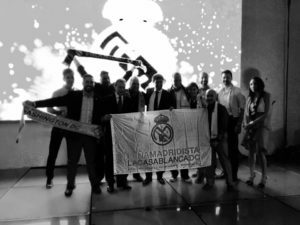 The feeling was less of a fan experience and more of a confirmation that I was part of Real Madrid… the philosophy, the team, and the family. ¡Hala Madrid, y nada más!